January 22, 2013. Seems so far away, but I know it’ll be here before I know it. That’s the day I’m having a prophylactic bilateral mastectomy (PBM) and start the breast reconstruction process. A PBM is an elective, preventative procedure which surgically removes breast tissue (see more details under WHAT IS A PBM?). You’re doing what with WHAT? Ya, I am doing it. I have thought long and hard about what this really means. I have discussed this with family, friends, and doctors. I have done hours of research, almost ad nauseam. After considering all of the factors, the risks, the benefits, the uncertainties, the consequences, I know this is the right decision for me. 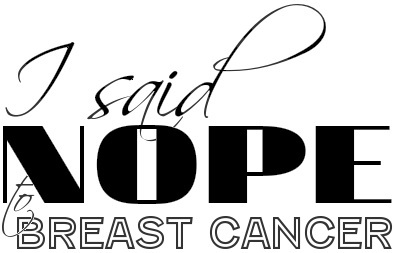 This entry was posted in All, My Story and tagged breast cancer, breast reconstruction, health, mastectomy surgery, Plastic surgery, prophylactic, surgery on October 27, 2012 by nope2BC.